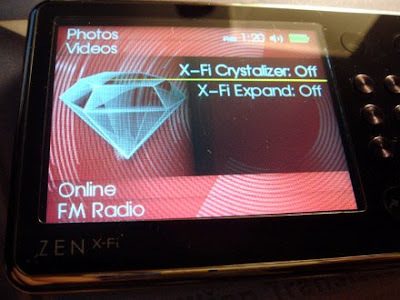 One of the major selling point of the ZEN X-Fi is but of course the X-Fi (Xtreme Fidelity) feature. Introduced in 2006, the X-Fi is Creative's proprietary audio platform that promises to make your music sound way better than it actually is. Having experienced the X-Fi technology on its soundcard and personally owning a Xmod, i'm impressed at what X-Fi can do to your music. 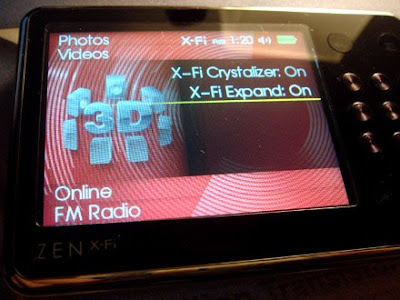 However, as explained earlier, Creative have had alot of problems placing the X-Fi chip into a portable media player as it is too power consuming. So, did Creative really manage to find a solution to that problem or does the ZEN X-Fi simply not have a X-Fi chip? In the official ZEN X-Fi commercial, it shows the X-Fi logo slowly falling onto a chip as the "world's first X-Fi engineered media player". On its official page, it's said that the ZEN X-Fi is "built with the X-Fi technology". No where did they claim to have an actual X-Fi chip placed in the player, which makes me believe that it has taken the same approach as the Soundblaster Xtreme Audio, where software is used to emulate the X-Fi effect. Nevertheless, I'm very happy to say that the X-Fi feature does provide a rather dramatic improvement to your music! Someone asked if we are able to set the extent of the X-Fi effect on the player (like on the Xmod and soundcards), the answer is yes and no. Yes as you are able to set to "ON" and "MAX" while no because you cannot set the percentage of X-Fi you want to on your music. Okay, I'm calling this section "take my words for it" because i don't really have a way to show you how the X-Fi is able to improve the ZEN's audio quality. 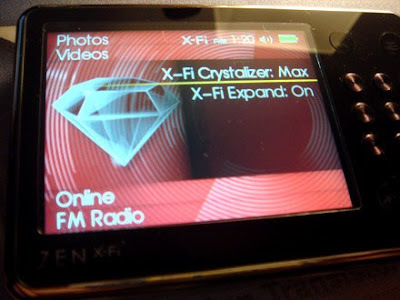 With the X-Fi Crystalizer ON, your music immediately becomes more rich and crisp. And if you like music with bass, the crystalizer really increase the intensity of the bass, which would make you really happy. However, when the X-Fi Crystalizer is set to MAX, the bass for certain songs became to overpowering and the vocals also became very sharp. Therefore, to enjoy the most out of the X-Fi, setting it to ON mode is sufficient. The improvement the X-Fi Expand provides on the other hand is less obvious. What it realy does is to spread out the audio to create a what was like a mini surround sound environment on the earphone. I used the X-Fi Expand purely for watching movie on the ZEN X-Fi as it's nice hearing people's voice projecting from both earphones instead of simply one side. As with the ZEN, the ZEN X-Fi also comes with adjustable EQ (custom, acoustic, classical, disco, jazz, new age, pop, rock and vocal), Smart volume and bass boost. 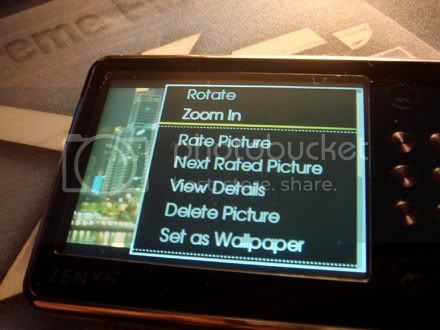 The photo viewing function on the ZEN X-Fi very much the same as the ZEN. 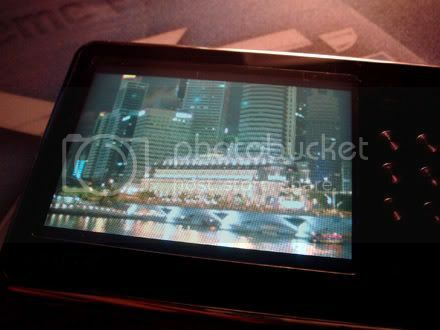 Photo format wise, it supports JPEG, BMP, GIF, PNG & TIFF. It is interesting to note that the zooming function have been improved on the ZEN X-Fi. 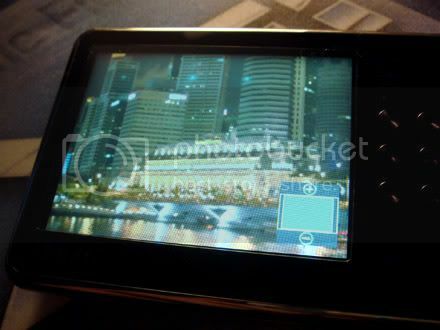 Now you are able to zoom in or zoom out and select a particular portion of the photo and then navigate left and right of it. Creative claims that the ZEN X-Fi has wide format support so that we can enjoy "all your music, photos, videos in various formats without the hassle of reconversion". For video, the ZEN X-Fi supports MJPEG, WMV9, MPEG4-SP4, DivX4 4/5 and XviD4. And since that's the same as the ZEN, it means that we are going to spend most of our time converting our videos before we can start enjoying them. I do miss the days of the ZEN Vision: M and W. It truely accepts a wide range of format, so much so that I don't remember reconverting anything for it. 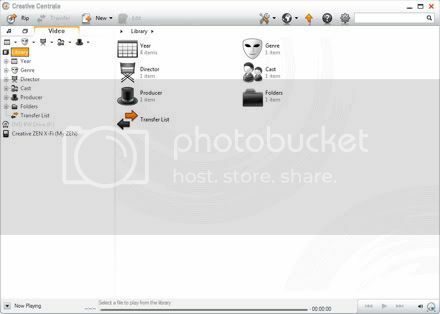 The new Creative Centrale is arguably one of the worst Creative software I have ever used. It does not allow me to create sub-folders in the video folder. And after I manage to create a sub-folder (say "Movie"), the Centrale does not allow me to transfer video to "Movie". Instead everything I transferred simply went into the video folder. And when it comes to conversion, you can't choose what quality you want your movie to be converted to, or whether you want to crop it. To overcome this problem, I had to use the Creative Video convertor to convert first and then drag it into Centrale. If there's a ZEN X-Fi Media Explorer (like the ZEN, ZEN Vision W, ZEN V Plus), it would have greatly improved my user experience. At the same time, I'm having trouble streaming my media content onto the ZEN, because yes you guessed it, it's controlled by the Creative Centrale. Thanks for part 2 :)..
Creative ZEN X-Fi Video Converter, which converts video files to formats suitable for wireless streaming, will be made available for web download early August 2008. 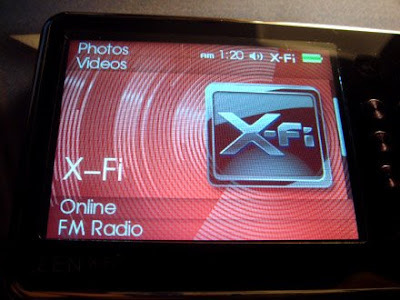 X-Fi is basically an algorithim, which needs hardware and software to work. What matters is the Output.. X-Fi here is solely for music. My defense is, if Creative's DSP (digital signal processor) was powerful enough to implement X-Fi to music level.. its No Different from the 'X-Fi Chip'. The same thing I say about Xmod. Also, in the Zen X-Fi video, Creative shows X-Fi being IN the Player.. and they are pretty bold about the sound/potential of it. View 3: Drap and Drog FTW !! Question 1: Youve tried the Xmod, and so have I.. now youve tried the Zen X-Fi.. Is the Zen X-Fi as good as the Xmod ? Question 2: Just being sure, X-Fi expand.. same as CMSS 3D rite? Thanks again ! and waiting to see the next main thing: WiFi capabilities. - Streaming podcasts and live channels on Creative Mediabox. Once again - Damn great review pt. 2!!! Could you please kindly elaborate more on the SD Card integration? I have been using iPods and would like to get the player, but was thinking of adding a 16GB card into it, and was wondering how it would affect me if there were no SD card integration. Kingone, do you think you could compare the sound quality of the Zen X-Fi to another well known DAP? For e.g. 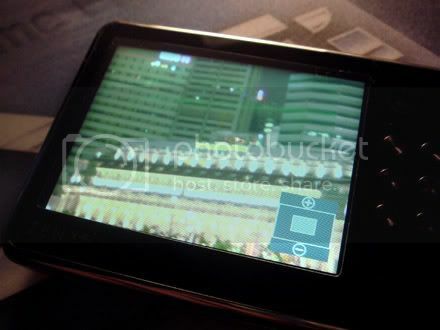 the Rio Karma or the newer iPod Classic perhaps? That would be much appreciated!